NEW YORK (Reuters) - A gauge of world equities was little changed after giving up early gains on Thursday, continuing a pattern seen for the past several sessions, while the euro eased after the European Central Bank formally ended its bond purchasing scheme. 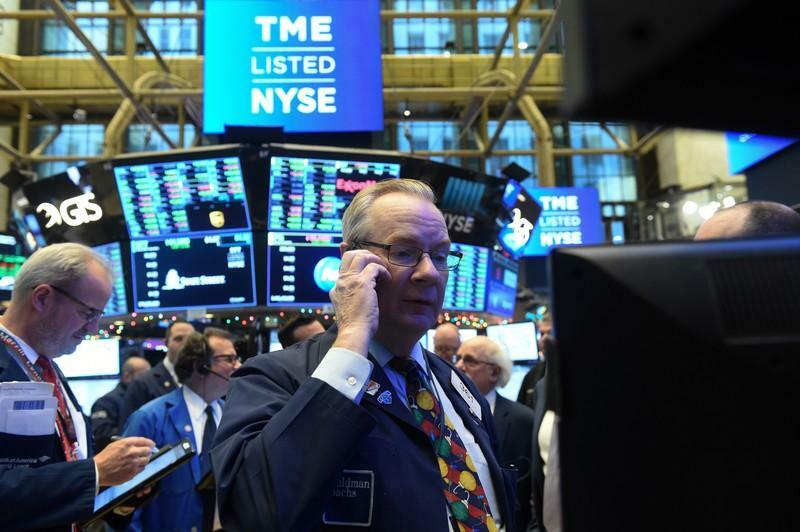 In the United States, the S&P and Nasdaq finished in the red while the Dow closed well off its session highs as cautious trade optimism faded. Nervousness has heightened volatility in stocks recently, with a tendency for stocks to lose morning gains as the day wears on. "It's a market that's been very nervous. Investors get excited in the morning and then their fears come back," said Omar Aguilar, chief investment officer of equities at Charles Schwab Investment Management in San Francisco. "We need a catalyst to get us a more consistent trend - it could be good economic data or more clarity on the Fed's intentions for next year or more certainty in U.S.-China. I don't think it's going to happen any time soon." The Dow Jones Industrial Average <.DJI> rose 70.11 points, or 0.29 percent, to 24,597.38, the S&P 500 <.SPX> lost 0.53 points, or 0.02 percent, to 2,650.54 and the Nasdaq Composite <.IXIC> dropped 27.98 points, or 0.39 percent, to 7,070.33. U.S. economic data showed jobless claims fell last week to near 49-year lows, while import prices dropped as the cost of petroleum products tumbled. Shares in Europe edged lower to snap a two-session winning streak, as concerns about Britain's exit from the European Union and euro zone growth outweighed a budget compromise in Italy. The pan-European STOXX 600 index <.STOXX> lost 0.17 percent and MSCI's gauge of stocks across the globe <.MIWD00000PUS> gained 0.05 percent. Britain's weakened prime minister, Theresa May, survived a late night no-confidence vote, and then said she did not expect a quick breakthrough in Brexit talks that would help get the deal through parliament. The dollar index <.DXY> rose 0.02 percent, with the euro down 0.04 percent to $1.1363. Sterling , rebounding from earlier declines, was last trading at $1.2662, up 0.26 percent on the day.